all photos©Alan & Linda Detrick, Ellen Spector Platt design. A firm believer in the value of lazy gardening, I prune conifers only as I need them for decoration or for mulch. As I cut for wreath, garland or mantelpiece, I shape the shrub thereby skipping the step of dragging trimmings on the compost pile. 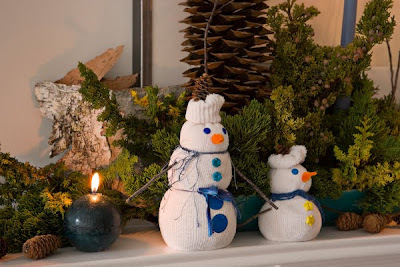 Here I've combined fresh greens with home-made snowmen for a winter theme. 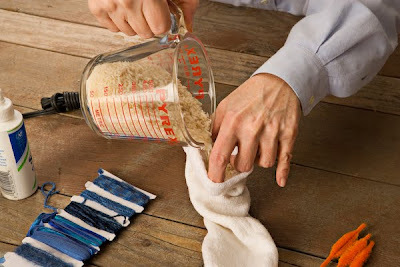 Pour the rice into the sock, leaving about four inches empty at the top. Close and secure with a rubber band. Turn down the cuff to hide the rubber band, forming a little hat. Tie a piece of ribbon at the neck and another one at the waist. Glue a cone at the top of the hat, small buttons for eyes and down the front. Cut a piece of pipe cleaner, poke it into the sock and glue in place. 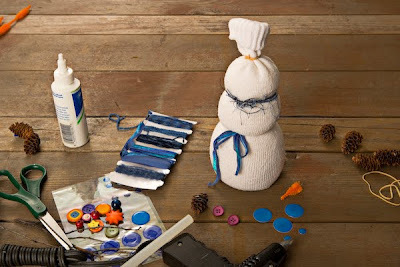 To make different size snowmen, cut off part of the top before filling. 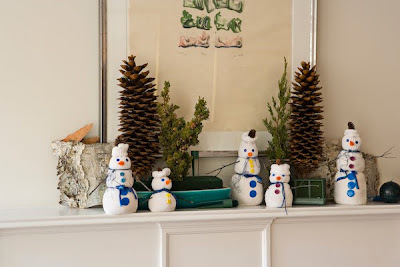 Start decorating the mantel with greens. To make greens stay fresh much longer, fill some containers with wet floral foam and stick in the stems. 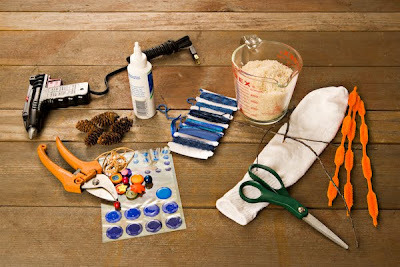 Add other large cones, pieces of bark and bare twigs, whatever you can come up with. 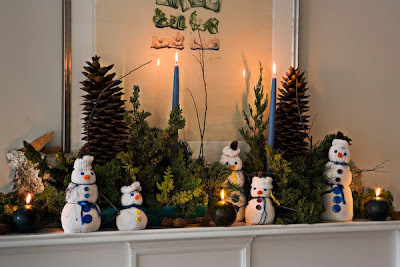 Place the snowmen and maybe some candles. IF USING CANDLES KEEP THEM WELL AWAY FROM ALL OTHER MATERIALS TO PREVENT FIRE. IN THESE 2D IMAGES IT'S HARD TO SEE, BUT THERE'S A GOOD SEPARATION BETWEEN THE FLAME AND OTHER STUFF!!!! Happy and merry to everyone. This is really cute. I wish I saw this few weeks earlier and I would've made it for all my colleagues! I'll keep this in mind for next year. Thanks for the great idea! Thanks Louise. I was a little remiss in not posting this in Nov., but if you do make the snowmen remember that they can be stored and will last for years. 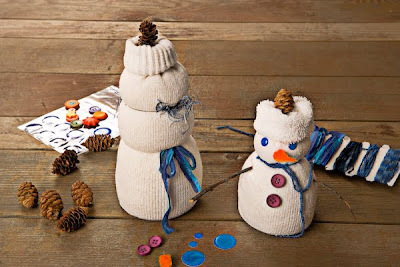 so the kids can do them on our Christmas workshop day next year.